Pete Kazanjy is at it again, finding so much material for this blog that I'm starting to feel guilty that he's not on the payroll. This time, the suggestion came with a disclaimer, "not sure if this is Unpressable Buttons material" - oh, Pete, it certainly is! 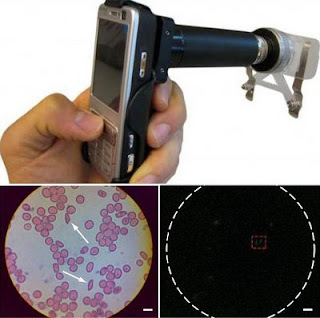 The subject is the development of a microscopy attachment for cellphone cameras, by the University of California at Berkeley. The value of such a tool may not be obvious to most of us, but that's because most of us have never been where this tool has value: in the clinics of the developing world, where (according to the article on ScienceBlogs) "resources are limited and laboratory facilities scarce, but mobile phone networks are ubiquitous." This attachment provides the necessary hardware to enable life-saving diagnoses, while keeping costs down by leveraging existing devices and infrastructure. That is good, usable, well-thought-out product design!